Rich butternut squash tastes fantastic with this fragrant curry sauce, which uses a mild paste made from chillies, coriander, lemon grass and garlic. Cut the squash into 2cm chunks. Heat the groundnut oil in a wok or large pan, then add the onion and stir-fry over a high heat for 2-3 minutes until it starts to turn golden. Reduce the heat to medium, then add the squash to the pan and cook for 10-12 minutes, stirring occasionally, until browned and just tender. Reduce the heat further if the squash starts to brown too much. Stir in the sugar snap peas and Thai green curry sauce, reduce the heat slightly and cook for another 3-4 minutes until heated through. Remove from the heat, season to taste, tear the basil leaves in half and scatter over. 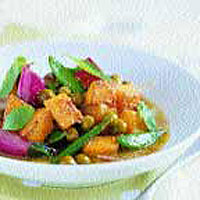 Serve with Waitrose Thai Fragrant Rice or a 350g pack of ready-prepared Waitrose Thai Fragrant Rice.